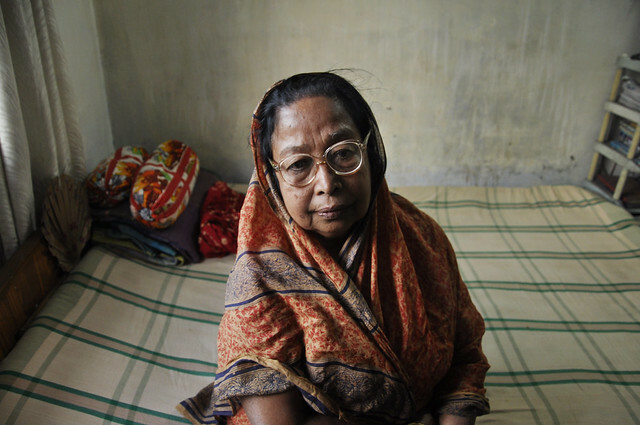 Rabeya Khatun sits on her bed in her home in Barisal, Bangladesh. April 2011. Apni amar meye, Rabeya Khatun says as she presses me in a tight embrace. You are my daughter. I had met Rabeya only an hour and a half ago. With the sun quickly darting from the sky, she gathered herself quietly in the corner of the sofa in the beginning of our time together. What are you doing here, she asks, why have you come? I want to learn from you about what happened in 1971, I say, how did the Liberation War affect your life? She holds my simple question for a moment, looking down slightly at her hands, before beginning a story she has told in full only a handful of times before. As she speaks, memories fill her eyes and I watch as the war opens in front of her. Her tale gains momentum, twisting from her childhood to her home life to the battlefield. Her voice becomes shrill as she leaps up, bending over, motioning how Pakistani soldiers held her back as they killed her son. Her eyes become electric, her stories continue without prompting, with words and memories she has not shared in years spilling out, tumbling onto our hands and notebooks folded quietly in our laps. The diary she kept during 1971 shakes in her grasp as she sings a few lines from it, songs from the war camps. Her voice breaks at the melody’s end, and she settles back down onto the sofa, gazing down at the pages clutched in trembling fingers. We share tea as she leads me around the house, pointing out pictures and objects that help bring the memories back. The time grows short and I have to catch the launch back to Dhaka, but first she takes me up to her roof to view the setting sun as it comes over the tops of the trees, spilling bright orange light onto her like-colored sharee. It is there that she looks into my eyes, and this women, who lost her husband and son in a war to which she gave herself fully, calls me, an American girl she has only known a couple of hours, her daughter. Rabeya, and a handful of other courageous, beautiful, and remarkably strong women have become a part of my life through an inquiry began six months ago upon my arrival in Bangladesh. Since then, I have been exploring the post-conflict experiences and struggles of the Bangladeshi women who played frontline roles as combatants in Bangladesh’s war of independence, and who, since the creation of the nation in 1971, have had to struggle not only for justice, compensation, equal rights and recognition, but also for their dignity, honor and womanhood. The project started as a kernel of an idea, sparked by photographs I saw in Drik Photo Agency’s 1971 archives of Bangladeshi women in beautifully draped white sharees, marching in perfect lines, rifles perched on their shoulders. Images led to questions – What was the role of women in this war? Why isn’t their history as readily known as other narratives in the mainstream? – that have blossomed into what is now this “Women Warriors” project. Though a largely independent endeavor, the work is now supported by The Aftermath Project, an organization founded by documentarian and storyteller, Sara Terry, which supports projects focusing on challenges faced and coping mechanisms developed by communities following conflict. The women that I have met and the stories that I have heard through this work have been fascinating and heartbreaking. Conversations have included women who formed the movement, meeting every week under a banyan tree at Dhaka University to protest the continued oppression of the West Pakistani political elite; those who dedicated their lives to the war, losing children and spouses, parents and siblings, all they felt closest to; women who provided unwavering care and shelter to extended family and fellow fighters, strengthening the war effort and moving it forward; those who stepped into spaces that even many men would not dare to go. “Women Warriors” aims to highlight these stories, to find and record the histories and accounts of more women like Rabeya. It hopes to create a broad and in-depth visual and oral documentation, one that focuses on the courageous and crucial role these women played in Bangladesh’s struggle for liberation, and the challenges they have encountered in reconstructing their own lives since. This project explores the demands of the dual-identity of fighter and caregiver, and what it means for those women who have assumed it. It investigates the individual efforts that were required to overcome the rejection by their community, which so many had to face upon returning from war. The conversations that I have had since moving to Bangladesh have made the purpose and urgency of this project increasingly clear. Each woman I speak with has a beautiful and vital voice, and while some have been heard loudly and clearly in the past, far too many have not. Like Rabeya’s, some have come pouring out having been held inside for years, decades even. Acknowledging and documenting these histories is a crucial part of the reconciliation process, and vital if Bangladesh – and the women who fought for its independence – are to find justice and peace. As these women share their stories, I will share them on here, along with a few images from the trips to speak with these extraordinary warriors.